I tend to shy away from casseroles that call for "Cream Of" soups. While this recipe does call for cream of chicken, I was able to create a tasty recipe without it. This dish was incredible. Rich and creamy and weight watcher friendly! Place chicken in an even layer in a lightly sprayed baking dish, set aside. To prepare sauce: in a saucepan whisk together milk, cream cheese, chicken broth, Dijon mustard, garlic powder, onion powder, salt, and pepper. Cook over medium heat stirring constantly until mixture just begins to gently boil. Once the mixture is boiling add in half of the shredded swiss cheese and stir until cheese has melted and mixture has thickened. Remove from heat and pour sauce mixture evenly over chicken and cooked rice. Spread into an even layer. Sprinkle ham over the sauce then sprinkle the remaining shredded swiss cheese evenly over ham layer. Sprinkle crushed croutons evenly over the cheese. 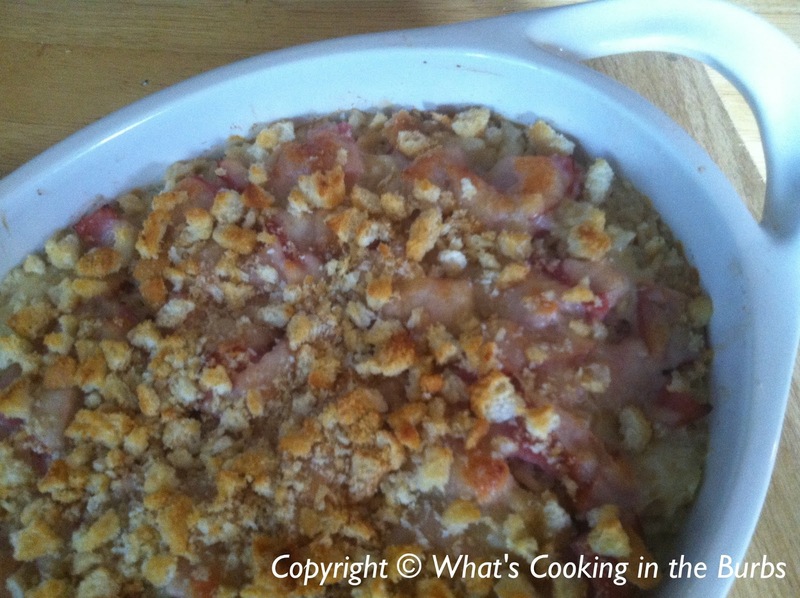 Bake casserole for 15-20 minutes or until heated through and the top is lightly browned. Enjoy! I love that this is diet friendly. Thanks for sharing. Bridget, This sounds like a good idea. And easy to make too. Thanks for sharing. This sounds awesome, definitely a awesome twist on a classic. Feel free to stop by my link party and share some of your fantastic recipes! I had to pin this to try - I know my family will love this, Bridget! Thanks so much for sharing at All my Bloggy Friends - I can't wait to see what you share this week! Yes! Bake it! :) What a fab idea! Thank you so much for linking up with me this week at Tasty Tuesdays! I’ve pinned this & shared it with my followers! Looks so good! you say in the direction to pour the sauce over the cooked chicken and rice....how much rice did you use for this recipe? (doesn't say in the ingredients). Oh My! I had no idea that I even left that part out of the recipe. Thanks for letting me know. I used 4 cups cooked brown rice.